GDP real growth rates, 1990–1998 an 1990–2006, in selectit kintras. Economic growth is the increase in the mercat value o the guids an services produced bi an economy ower time. It is conventionally measured as the percent rate o increase in real gross domestic product, or real GDP. O mair importance is the growth o the ratio o GDP tae population (GDP per capita), which is an aa cried per capita income. An increase in per capita income is referred tae as intensive growth. 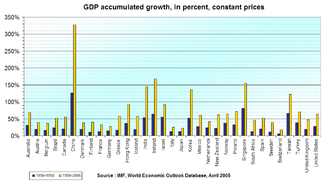 GDP growth caused anly bi increases in population or territory is cried extensive growth. ↑ Bjork, Gordon J. (1999). The Way It Worked and Why It Won’t: Structural Change and the Slowdown of U.S. Economic Growth. Westport, CT; London: Praeger. pp. 2,67. ISBN 0-275-96532-5. This page wis last eeditit on 27 Dizember 2013, at 22:00.